(Nanowerk News) Hydrogen-powered fuel cells and solar energy are the best hope for a more environmentally friendly and resource-sparing energy supply in the future. A combination of the two is considered to be particularly “clean”: the production of hydrogen by splitting water with sunlight. Previous approaches to this have suffered from high costs and the limited lifetime of their catalytic systems. In the journal Angewandte Chemie ("Water Splitting by Visible Light: A Nanophotocathode for Hydrogen Production"), a team led by Thomas Nann and Christopher J. Pickett at the University of East Anglia (Norwich, UK) has now introduced an efficient, robust photoelectrode made of common, inexpensive materials. The new system consists of a gold electrode that is covered with layers of indium phosphide (InP) nanoparticles. The researchers then introduce an iron–sulfur complex, [Fe2S2(CO)6], into the layered arrangement. When submerged in water and irradiated with light under a relatively small electric current, this photoelectrocatalytic system produces hydrogen with an efficiency of 60%. “This relatively high efficiency is a breakthrough,” says Nann. 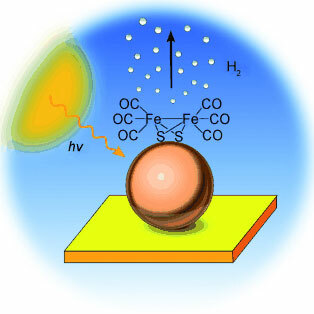 The researchers have proposed the following mechanism for the reaction: The incoming light particles are absorbed by the InP nanocrystals and excite electrons within the InP. In this excited state, the electrons can be transferred to the iron–sulfur complexes. In a catalytic reaction, the iron–sulfur complexes then pass their electrons on to hydrogen ions (H+) in the surrounding water, which are then released in the form of hydrogen (H2). The gold electrode supplies the necessary electrons to replenish the InP nanocrystals.